Life’s Too Short to Not be Irish! 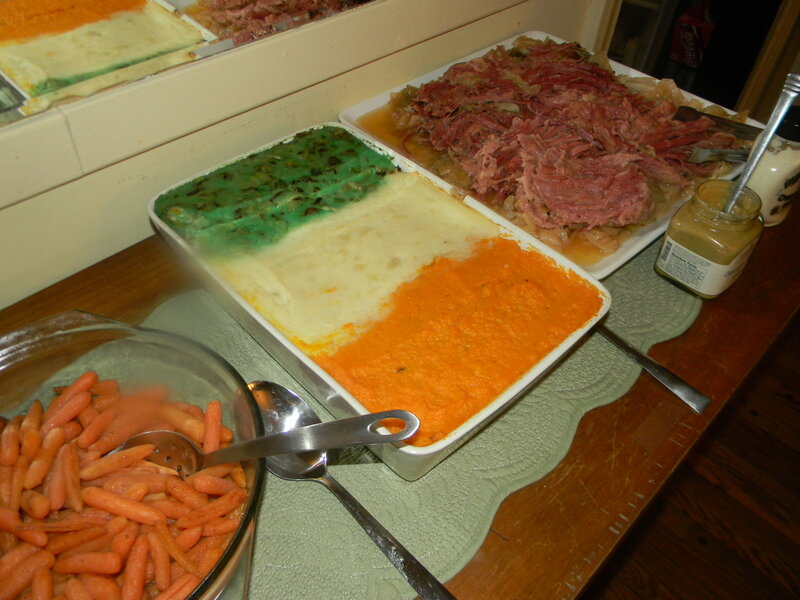 Since I had to celebrate St Patricks Day early with my family I took this as an opportunity to share what we had for dinner in case you needed some ideas! Even people who aren’t Irish pretend they are on St Patricks day! 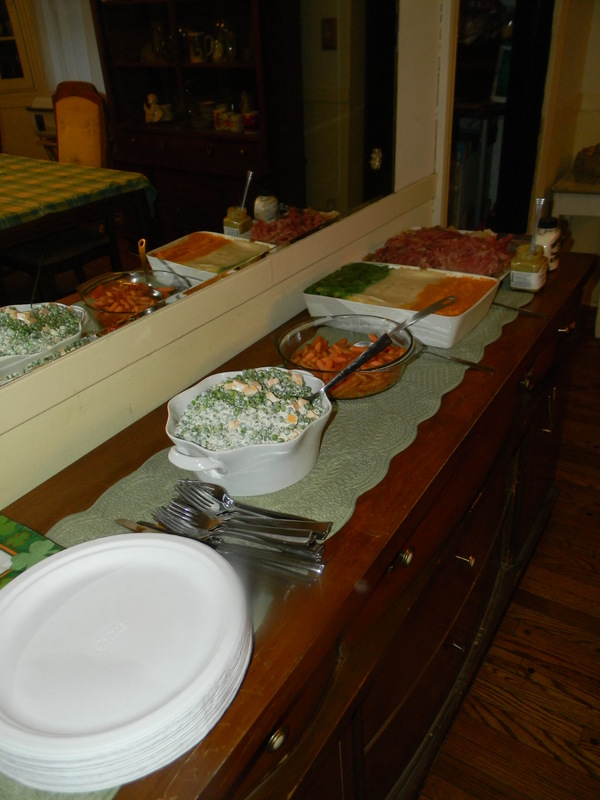 Before you go out drinking eat some of these delicious dishes to sop up that alcohol! I will give a short description of each the item since most of the recipes were pretty darn simple and don’t require much explanation. Pea & Cheddar Salad – 1 Bag of Frozen peas, 1 package of cheddar cubed, about 1 cup mayo, 1 cup sour cream, splash of mayo, salt/pepper/onion powder. Mix together and chill overnight. Ginger & Honey Glazed Carrots – melt butter in a saute pan and add carrots stirring frequently. Add desired amount of honey and a few shakes of ground ginger. Saute until caramelized. Add salt and pepper to taste. Boil and mash sweet potatoes, add a little bit of butter, salt & pepper. I added a layer of marshmallows in the middle since that’s how my family likes them. 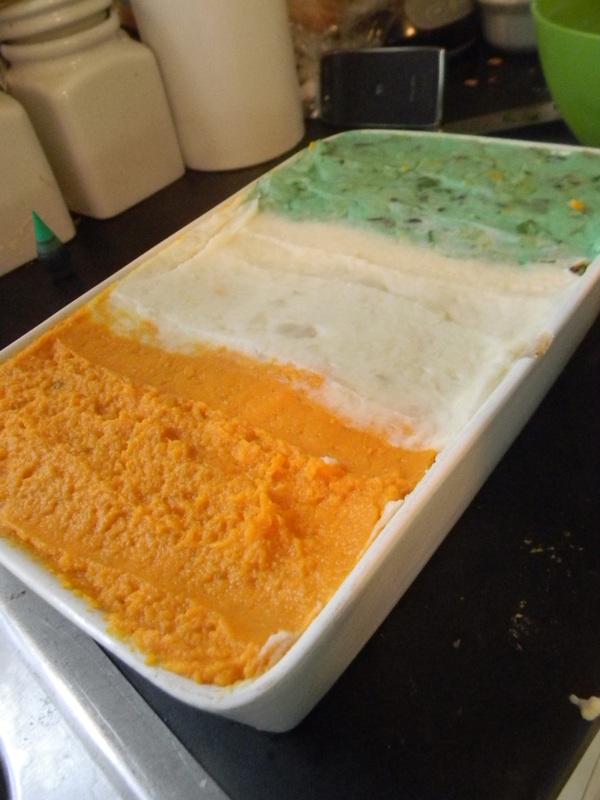 The white layer of potatoes is just regular mashed potatoes. I added sour cream, butter, white pepper and salt. For the green potatoes I sauteed cabbage and chopped up chives and green food coloring. Corned Beef & Cabbage – I cooked about 9lbs of corned beef in a roaster all day long. I added the cabbage about 2 hours before serving so that it didnt get too soggy. I served it with Champagne Shallot Mustard and Horseradish. Guinness Lamb Strew – My brother made this dish with my assistance. He wanted to make it just like the one he ate in Boston. It was just carrots, onion, celery, garlic sauteed in butter. 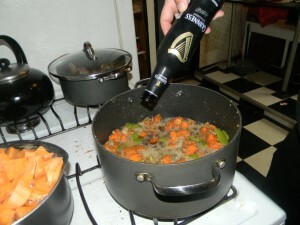 About 3 lbs of lamb, 1 bottle of guinness, beef stock, rosemary, salt & pepper. We served it over the mashed potatoes instead of adding cubed potatoes to the stew. Barley was also added per his preference.